The GJ 4, GJ 5 and GJ 5 Directional Cleaning machines are designed specifically for cleaning all types and sizes of open-topped vats, tanks, and vessels.These versatile units are turbine-driven and provide 180° rotary impingement cleaning to easily clean the sides and bottom of virtually any size application. With these cleaning machines, you get the cleaning power you need, in the direction you need it. 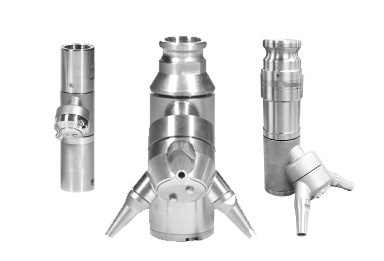 A choice of nozzle sizes, turbines and gear speeds offer a large range of flow rates, pressures and wash cycle times. The 180° and 105° directional units still maintain Alfa Laval's rotary impingement cleaning process. This process optimizes the water or cleaning solution driving the device, providing the maximum force from the jet stream leaving the nozzles and contacting the interior of the tank. The machine then moves the jet streams in a rotational pattern to cover the entire inside of the tank or vessel in a repeatable and reliable manner. The design of the machine not only ensures durability but efficiency as well. A minimal and controlled amount of leakage allows the machine to clean itself, while the majority of the fluid reaches the actual contour of the tank, scouring and cascading bit by bit.